Please help me with my latest essay. Thank you so much. The first table concentrates data from 100,000 participants about their trips to other countries and purposes from 1994 to 1998. Meanwhile, the second one illustrates their journeys’ ends in large. Overall, it is clear that number of travellers showed a constant upward trend from 22,072 people in 1994 to 28,828 people in 1998, in spite of a small dip in 1995 with 21,610 people. Subquently, holiday was considered as the dominant reason as well as Western Europe always the most favorable spot. According to the first table, from 15,246 travellers in 1995, number of people who went abroad on hodiday increased gradually to 20,700 people in 1998 after dropping slightly to 14,898 people in 1995. This number surpassed the rests significantly, evidently the lowest number of travelers who did not do for hodilay, business or meeting friends and relatives, just fluctuated negligibly from 982 people to 990 people in 1994 and 1998 respectively. 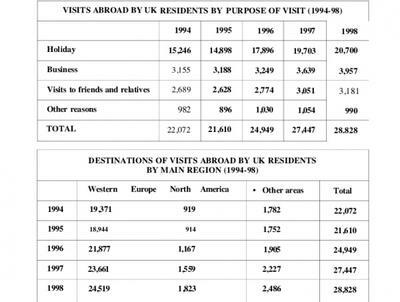 As can be seen in the second table, Western Europe attracted visitors the most with a gradual growing tendency, from 19,371 people in 1994 to 24,519 people in 1998. Having only 919 people in 1994, tourists who came to North America decreased faintly to 914 people in 1995 then skyrocketing up to 1,823 people in 1998 but was obviously indicated as the lowest number. You really need to pay a lot more attention to those minor mistakes. It can deduct your score. - You missed "UK residents". I think you should add "UK" before "participants". - Spelling mistake with "subquently". However, "subsequently" means "later (on)", "afterward", which is not suitable here. You can write "Among them", in my opinion. - 15246 travelers was in 1994, not 1995. - the rest, omit S.
- (hodilay) typo again. By the way, you wrote: "the number of people who went abroad on holiday" and then "the ... who did not do for holiday ...". Be careful, please. - "gradually" growing tendency. Gradual is to support "growing", not to support "tendency", so it should be an adverb. - when you use "having", what have 919 people? Not the "tourists" ==> Having only ..., North America had a faintly decreased number of tourists, 919 people in 1995, ..